I'll fly away, originally uploaded by jahansell. The Sharon Center School gym was overflowing today - people standing in the aisle, the hallways and the stairwells to celebrate the life of Kaelan Paton. 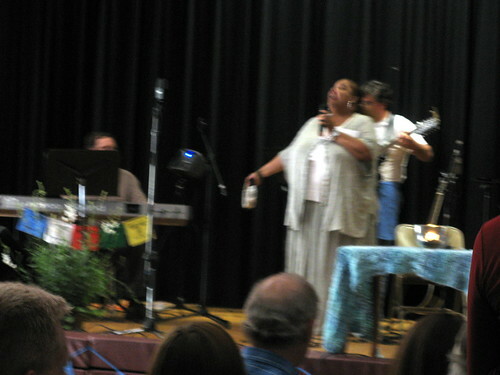 There were prayers from the bible and from Buddhism, reminiscences, folk songs from the many friends of the Paton clan, tears, laughter, and this glorious performance of "I'll Fly Away" by the incomparable Wanda Houston, accompanied by just about everyone in the audience. But the most wonderful part was when one of Kaelan's teachers read an essay he had written last year as he was graduating from eighth grade. He reflected, with wisdom and wit, on his realization that school wasn't a waste of time - that learning the multiplications tables had a purpose. His purpose on this earth was manifold: to bring people together, to promote love and social justice, and finally, to save the life of another. As one of the many singers said to Kaelan's siblings, 'your relationship with him doesn't end, it's just different." That's the thought I will hold on to for the day.